drift, Ría de Vigo, Galicia, Spain, 2016. Ignacio Bárbara. © Ignacio Bárbara (barbara@udc.es). Trailiella intticata, Ría de Vivero, Galicia, Spain, 2015. 24 Dec 2016. Ignacio Bárbara. © Ignacio Bárbara (barbara@udc.es). North of Galicia, Spain, 2014. Ignacio Barbara. © Ignacio Barbara. Published in: Hariot, P. (1891). Liste des algues marines rapportés de Yokoska (Japon) par M. le Dr Savatier. Mémoires de la Société nationale des sciences naturelles de Cherbourg 27: 211-230. The type species (lectotype) of the genus Bonnemaisonia is Bonnemaisonia asparagoides (Woodward) C.Agardh. Adjective (Latin), hooked (Stearn 1973). This species has been introduced into the Mediterranean (Verlaque et al. 2015: 113) being first found at La Galite in 1909, probably by shipping. It was also intoruduced into the NE Atlantic. English: Bonnemaison's Hook Weed (Bunker et al. 2010). 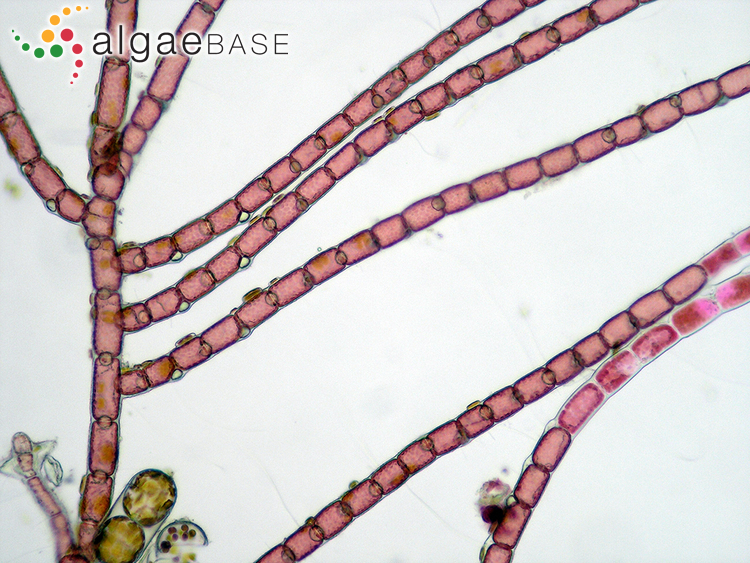 In Ireland and Britain, gametophyte plants occurring from March-June, brownish-red, fronds feathery, with a slightly flattened axis to1 mm wide and 350 mm long, attched to Cytstoseira and other algae by crozier-shaped, hook-like modified branches. Tetrasporophyte (“Trailliella-phase”) plants occurring all year round, but most obvious in October-March, brownish-red, much branched, filamentous, in dense cotton-wool-like tufts to 25 mm in diameter. 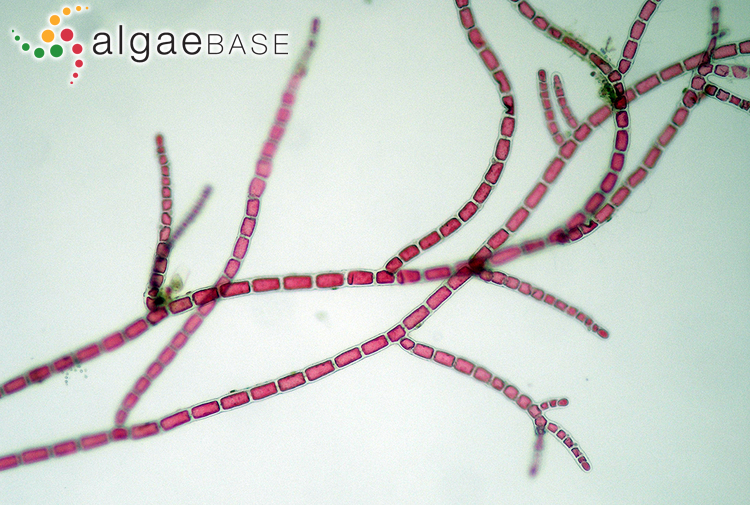 Probably introduced from Japan or its environs, at the end of the last century; gametophyte first found in Europe (Isle of Wight) in 1893, on rocks and other algae, lowest intertidal and subtidal, southern and western coasts, rare. Tetrasporophyte first recorded in British Isles (Dorset) in 1890, epiphytic on Corallina, lower tidal pools and subtidal, now widely distributed on southern and western coasts to Shetland Isles, frequent and can be abundant in certain locations, notably where there are large, lagoon-like lower intertidal pools. Crozier-shaped hooks for secondary attachment; sesonal occurrence from March to June. 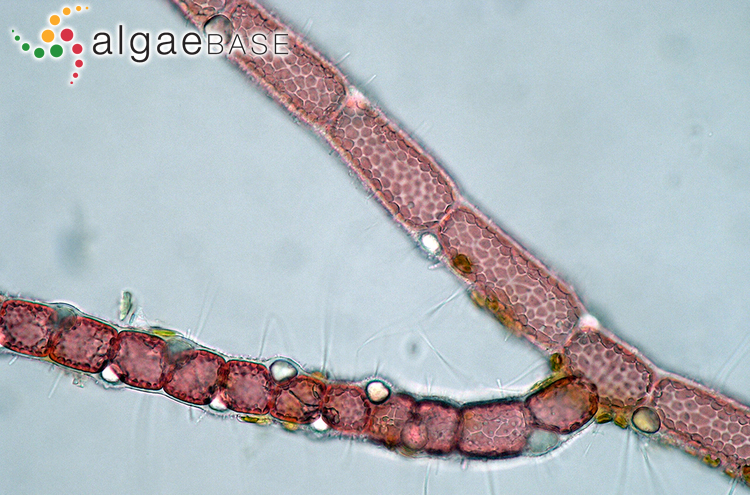 Gametophyte: B. asparagoides, which lacks the crozier-shaped hooks and is largely a subtidal plant. 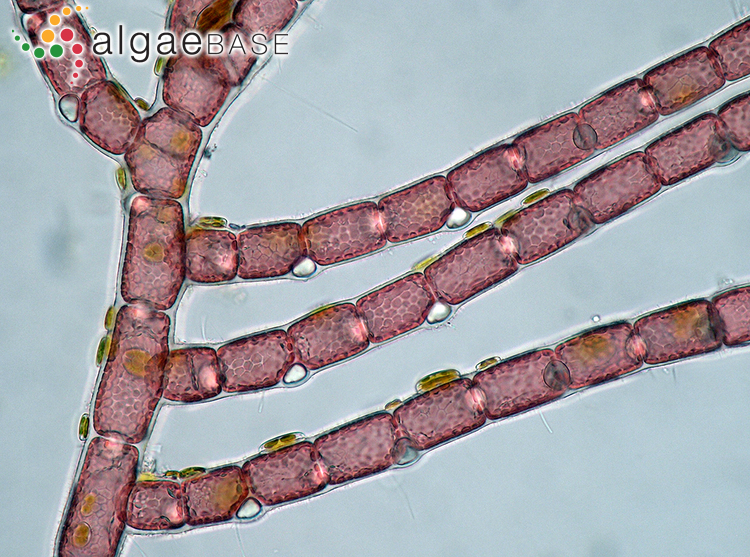 Tetrasporophyte: ball-like habit is shared with the 'Falkenbergia-phase' of Asparagopsis armata. 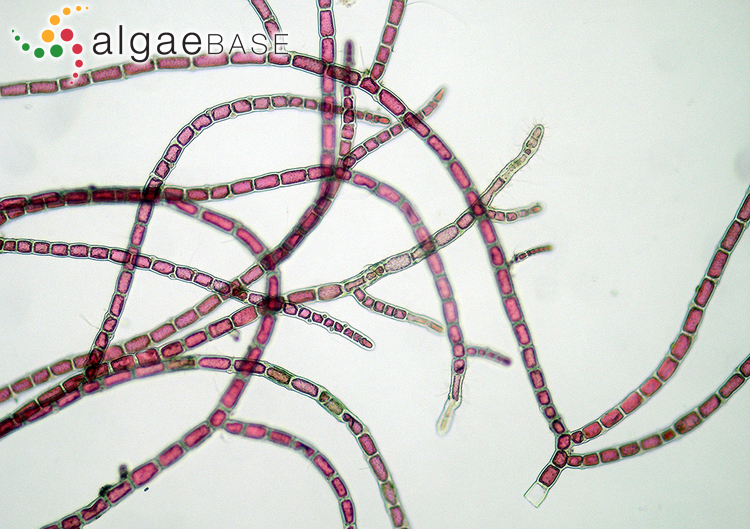 A microscope is required to distinguish the two: the tetrasporphyte of B. hamifera has small colourless cells that alternate from side to side of the filamet; these are absent in the tetrasporphyte of A. armata, which, in addition, is several cells in width. Type locality: Yokosuka, Japan Holotype: PC (Dawson 1953: 55). Notes: Dawson (1953: 55) notes that the holotype is from a collection by Dr. Savatier, probably in the Herbarium of the Museum d'Histoire Naturelle, Paris. Buffham, T.H. (1896). On Bonnemaisonia hamifera, Hariot, in Cornwall. Journal of the Quekett Microscopical Club, Series 2 6: 177-182, pl. IX. Dixon, P.S. (1959). Taxonomic and nomenclatural notes on the Florideae. I. Botaniska Notiser 112: 339-352. Schories, D., Selig, U. & Schubert, H. (2009). 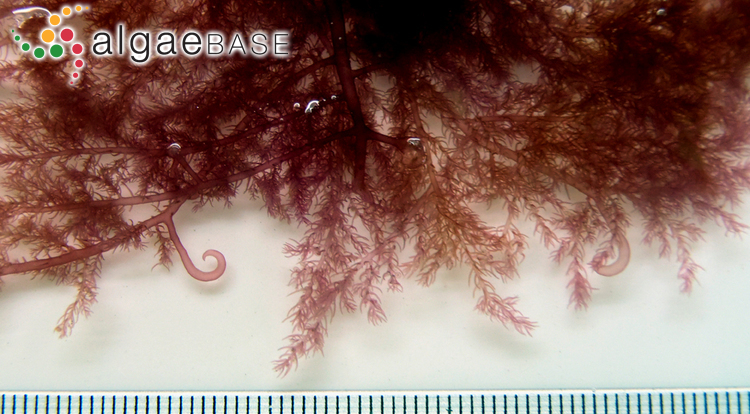 Species and synonym list of the German marine macroalgae based on historical and recent records. Rostocker Meeresbiologische Beiträge 21: 7-135. Accesses: This record has been accessed by users 15527 times since it was created. Breaud, J.B.B. & Floc'h, J.Y. (1966). Présence des gamétophyte mâles de Bonnemaisonia hamifera Hariot (Floridée, Bonnemaisoniacée) sur la côte atlantique française.. Compte Rendu Hebdomadaire des Séances de l’Académie des Sciences. Paris. Série D 262: 1949-51. Breeman, A.M. & Guiry, M.D. (1989). Tidal influences on the photoperiodic induction of tetrasporogenesis in Bonnemaisonia hamifera (Rhodophyta). Marine Biology, Berlin 102: 5-14. Breeman, A.M., Meulenhoff, E.J.S. & Guiry, M.D. (1988). 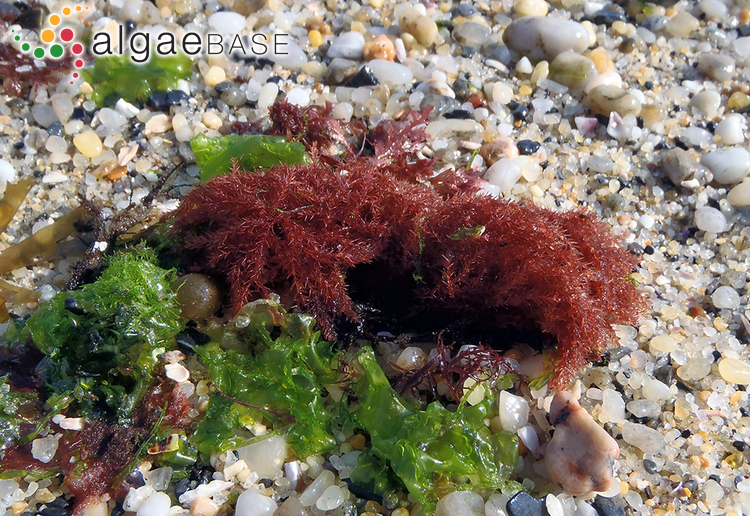 Life history regulation and phenology of the red alga Bonnemaisonia hamifera. Helgolander Meeresuntersuchungen 42: 535-551. Chen, L.C.-M., Edelstein, T. & McLachlan, J. (1969). Bonnemaisonia hamifera Hariot in nature and in culture. Journal of Phycology 5: 211-220. Chen, L.C.-M., Edelstein, T. & McLachlan, J. (1970). Vegetative development of the gametophyte of Bonnemaisonia hamifera from a filamentous state. Canadian Journal of Botany 48: 523-525. Floc'h, J.-Y. (1969). On the ecology of Bonnemaisonia hamifera in its preferred habitats on the western coast of Brittany (France). British Phycological Journal 4: 91-95. Harder, R. & Koch, W. (1949). Life-history of Bonnemaisonia hamifera (Traillella intricata). Nature (London) 163: 106 only..
Haugen, I.N. (1970). The male gametophyte of Bonnemaisonia hamifera Hariot in Norway. British Phycological Journal 5: 239-241. Kornmann, P. & Sahling, P.-H. (1962). Geschlechtspflanzen von Bonnemaisonia hamifera Hariot bei Helgoland. Helgoländer Wissenschaftliche Meeresuntersuchungen 8: 298-301. Lüning, K. (1979). 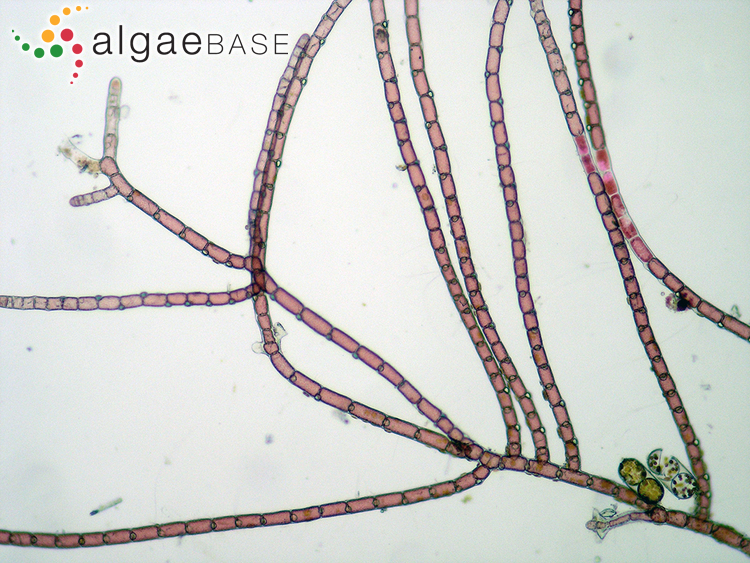 Photoperiodism in the Trailliella phase of Bonnemaisonia hamifera. British Phycological Journal 14: 125. McLachlan, J., Chen, L.C.-M. & Edelstein, T. (1969). Distribution and life history of Bonnemaisonia hamifera Hariot. Proceedings of the International Seaweed Symposium 6: 245-249. Nash, R., Rindi, F. & Guiry, M.D. (2005). Optimum conditions for cultivation of the Trailliella phase of Bonnemaisonia hamifera Hariot (Bonnemaisoniales, Rhodophyta), a candidate species for secondary metabolite production. Botanica Marina 48: 257-265. Pueschel, C.M. & Babuka, S.J. (1995). 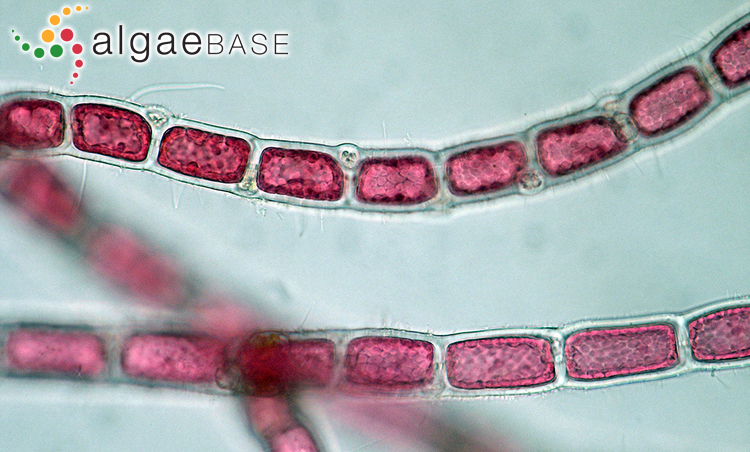 Chloroplast inclusions in Bonnemaisonia hamifera (Rhodophyta, Bonnemaisoniales). Cryptogamie, Algologie 16(2): 95-101. Silva, J., Salvador, N. & Rull Lluch, J. (2008). Polysiphonia perforans Cormaci, G. Furnari, Pizzuto & Serio y Bonnemaisonia hamifera Hariot nuevos registros para las costas mediterráneas de la Península Ibérica. Algas, Bol. Soc. Esp. Ficología 40:8. Simon-Bichard-Bréaud, J. (1970). Les preuves anciennes de l'existence de la reproduction sexuée de Bonnemaisonia hamifera Hariot (Bonnemaisoniacées) en Atlantique; leurs conséquences sur l'interprétation du cycle de cette Rhodophycée. Compte Rendu Hebdomadaire des Séances de l’Académie des Sciences. Paris. Série D 271: 1268-1271. Simon-Bichard-Bréaud, J. (1971). Un appareil cinétique dans les gamétocystes mâles d'une Rhodophycé: Bonnemaisonia hamifera Hariot. Compte Rendu Hebdomadaire des Séances de l’Académie des Sciences. Paris. Série D 273: 1272-1275. Simon-Bichard-Bréaud, J. (1972). Formation de la crypte flagellaire et évolution de son contenu au cours de la gamétogenèse mâle chez Bonnemaisonia hamifera Hariot (Rhodophycée). Compte Rendu Hebdomadaire des Séances de l’Académie des Sciences. Paris. Série D 274: 1796-1799. Simon-Bichard-Bréaud, J. (1972). Origine et devenir des vacuoles à polysaccharides des gamétocystes de Bonnemaisonia hamifera Hariot (Rhodophycée). Compte Rendu Hebdomadaire des Séances de l’Académie des Sciences. Paris. Série D 274: 1485-1488. Simon-Bichard-Bréaud, J. (1992). 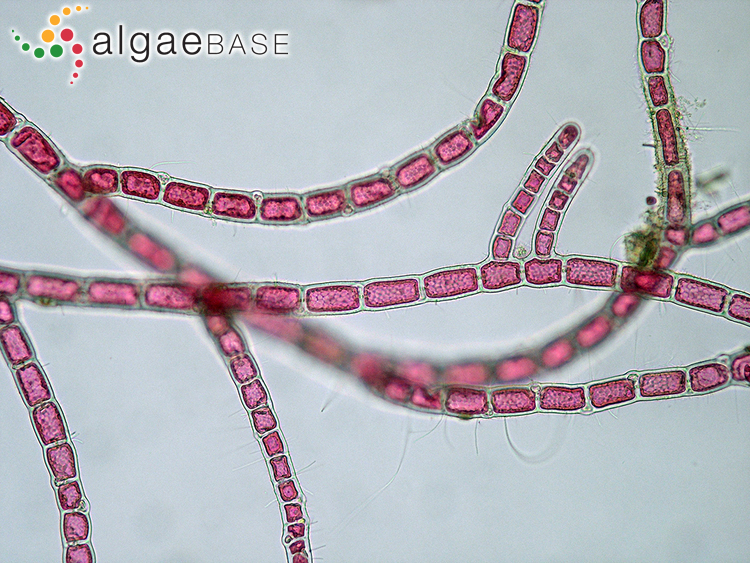 Le biocycle de Bonnemaisonia hamifera Hariot (Bonnemaisoniacée, Rhodophycée). Soc. Bot. Fr., Mém. : 311-312.